Savvy gardeners and professional garden designers are already in the throes of designing their spring gardens. They know that without a plan things can get crazy and behind schedule once Mother's Day arrives. As we review our plans, examine photos from the past year and delve into garden books and magazines for new plant ideas, one thing is on the top of our mind- annuals! 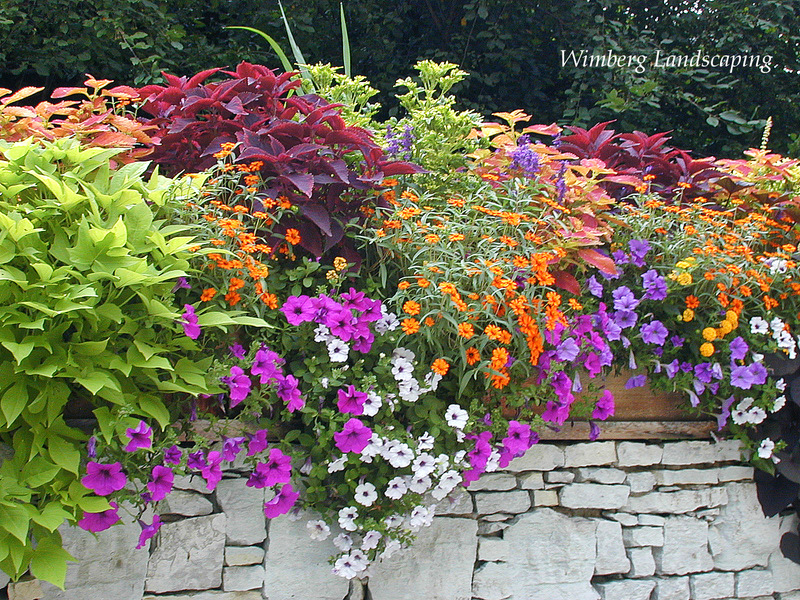 Here are reasons why you, too, should be planning with annuals. Most of the landscapes we design have a strong focus on trees, shrubs and perennials. Our landscapes are designed for longevity as well as year-round interest. But, even with a strong perennial garden plan, annuals are often called upon to fill in the spaces left open for foundation plants to mature. Rather than simply mulch these open areas, we opt to fill in with annuals for a more lush, colorful garden. Annuals give us what we want, instant gratification. Blooming from day one to first fall frost, and often times beyond, annuals provide the landscape with continuous, often carefree, color. Even established perennial gardens can benefit from strategically placed annuals to draw out the perennials’ foliage color, add brightness to a shady spot in the garden or mirror the color of the yet-to-bloom perennial flowers. For those clients who appreciate a well established garden, but still like the idea of something fresh and new each year, we call in the annuals! By leaving an extended area for annuals, such as a deep front border along a garden bed, we can add different annuals with new colors and textures each year. The foundation of the garden remains the same but each new garden season is ushered in with a new color palette. Container gardening with annuals is a pure joy. These miniature self-contained gardens allow us to work with countless container options such as terracotta, lead and copper pots to wooden barrels and even wicker baskets. If it holds soil, we can plant in it. Containers dress up a front porch or patio, and can be tucked into the garden for splashes of color and design interest They can also be replanted throughout the year to reflect the changing seasons- spring, summer and fall.